Este post está em inglês porque é minha entrada para o concurso da placa Fubarino no Hackaday. My entry for the Fubarino Contest is a modified version of the Video Display Adapter developed by Daryl Rictor for his 6502 SBCs. The hack consists of adding an extra configuration jumper and a few lines of assembly to allow the selection of a Boot Logo with the Hack-A-Day URL, as needed for the contest. The modification on the original hardware consists of a 10k resistor connected at pin 26 of the AVR. The other side of the resistor goes to a pin header and then to the GND. This pin of the microcontroller (PC3) is normally configured as an ouput, but it is briefly set as an input during the startup. If the jumper J5 is present, a reading on the pin C3 will return "0". Otherwise it will return "1" (High). That's exactly the same technic used by the author of the project to detect (and thus select) the NTSC/PAL option. The modded circuit can be seen on the picture below. 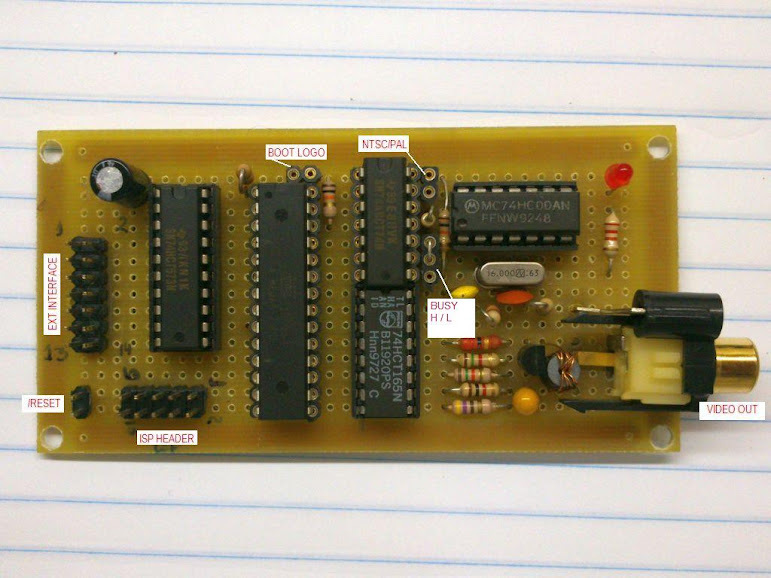 The circuit was assembled on standard board very similar to a veroboard. The Picture below shows the jumpers and the headers of the board. The original code underwent two modifications. One was the the boot logo itself. Instead of the original, I have reused the ASCII art from the retro.hackaday.com and added some stuff related to the contest. For converting the raw ASCII logo into a file that could be read by the AVR assembler, I've created a Python script. The code of the script is presented below. It doesn't check if the raw log has more than 40 characters x 25 lines but I think I can handle it by myself, so i kept the script simplest as possible. The other modification on the original code was on the routine that shows the logo at the start-up. It was preceded by an almost copy-and-paste of the code that checks the NTSC/PAL. It changes the state of the PC3 line (port C, bit 3) and activates its pull-up. Then, After a little delay (a bunch of NOPs, indeed) the pin is read. If the jumper J5 is connected the 10k resistor will bring the line down. and the screen buffer will be initialized with the contest Logo. Otherwise the Clear Screen (FormFeed) routine is called and the program continues. sbis pinc, vd7 ; is Pin c3 low? ldi Cursclk, 0x00 ; init cursor blink timer. Notice the variable "Cursclk", which is responsible for the delay time of the banner. The main code waits for "Cursclk" counts reach 255 (0xFF) before entering in the normal operation state of the interface. This variable increments at each video frame and it is initialized 0 when the Boot Logo is selected, thus providing a delay of 256 video frames (close to 4 seconds ). On the other hand, when the Boot Logo is not selected, this variable is initialized with 248 (0xf8), wich corresponds 8 frames or something close to 130ms. The video below demonstrates the operation of the hack. Initially the board boots without the logo option. Then the logo jumper is inserted and the board is restarted, showing the logo. Thanks for Daryl Rictor for sharing the code of his amazing interface. Without it this hack would not be possible. And I hope you have enjoyed my hack!